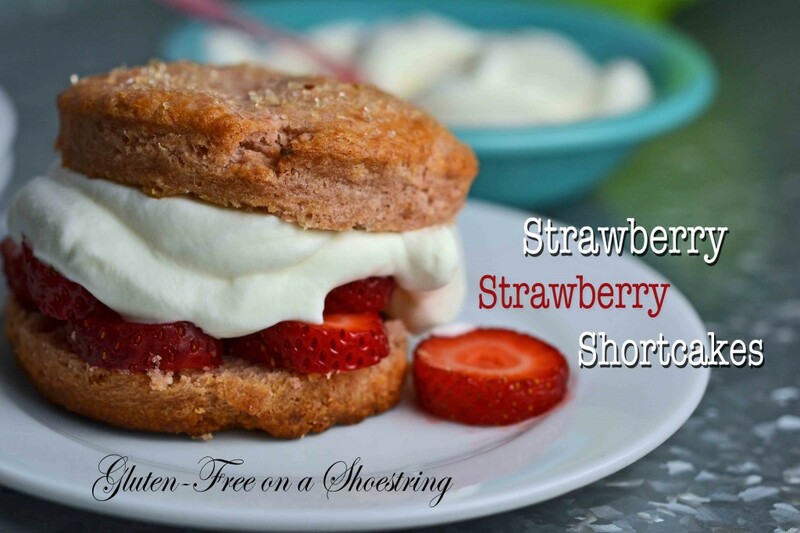 Strawberry Strawberry Shortcakes | Great gluten free recipes for every occasion. One thing I never really got about your basic Strawberry Shortcakes, in general. They don’t taste like strawberries. They’re really just sweet biscuits, served with strawberries and cream. Your traditional strawberry shortcake is still lovely, really. But I thought we could do one better. 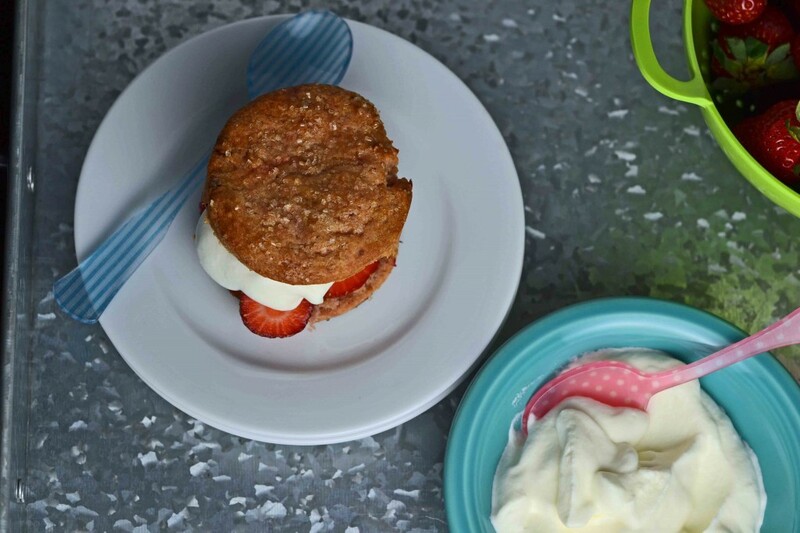 Let’s make our strawberry shortcakes into gluten-free Strawberry Strawberry Shortcakes. 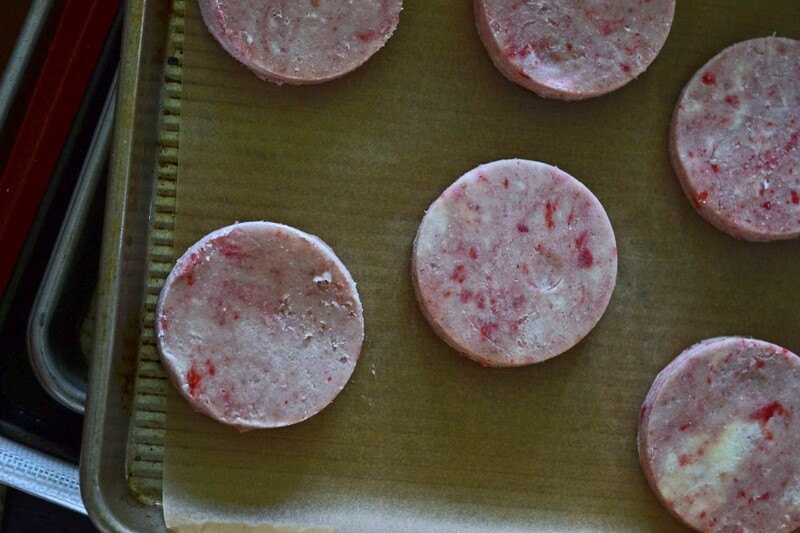 With some intense strawberry flavor baked right into the lightly sweet biscuits. I’m really into freeze-dried fruit. I feel like I’m eating astronaut food (having neapolitan astronaut ice cream when I was a kid was, like, the best thing that ever happened to me). And it’s a great way to add intense natural fruit flavor and color to food without adding moisture. Like gluten-free Froot Loops. Remember when we made those? And it makes for some pink dough. My almost-7-year-old little girl has more than a passing interest in pink. Bonus. Handle the dough lightly, as best you can. Follow the recipe instructions carefully, especially if you’ve never made biscuits before. You’ll get there, friend. 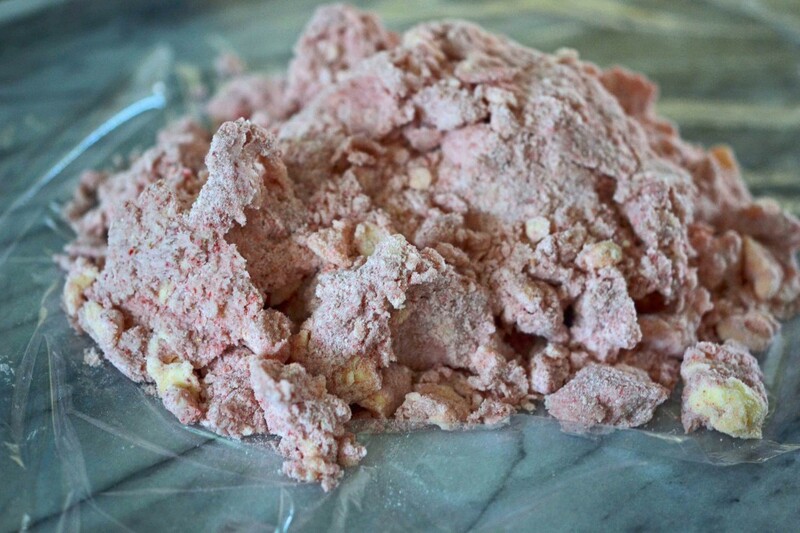 The biscuits themselves, as baked, will lose much of their pink color, but not all of it. Light and flaky, deeply strawberry-y, these shortcakes will show you what these last few days of summer are all about. Preheat your oven to 350 degrees F. Line a rimmed baking sheet with parchment paper and set it aside. 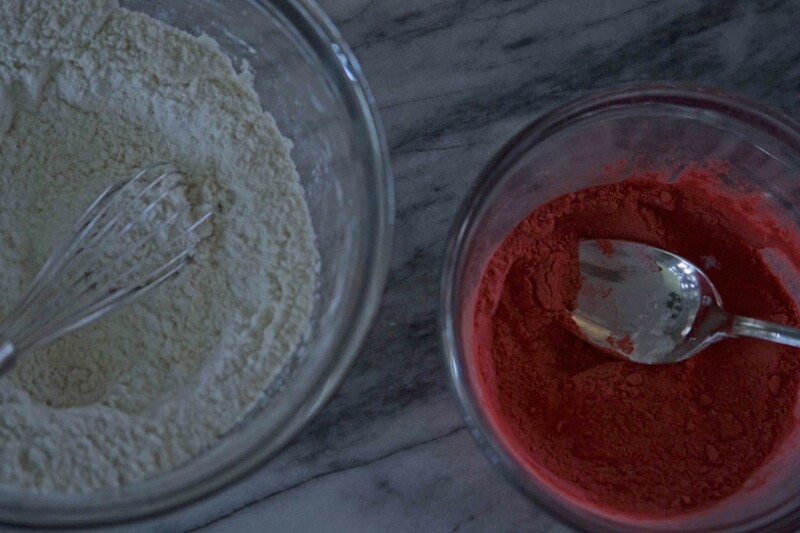 In a large bowl, place the flour, freeze-dried strawberry powder, sugar, baking powder, baking soda and salt, and whisk to combine well. Add the butter, separate the pieces and toss in the dry ingredients. With clean and dry, well-floured fingers, flatten the flour-covered pieces of butter. Create a well in the center of the bowl, and add the chilled cream. Stir gently to combine until the dough begins to come together. Turn the dough out onto a large piece of plastic wrap. Using the plastic wrap, press the dough into a flat disk and refrigerate for 10 minutes. Remove the dough from the refrigerator, and turn it out onto a lightly floured piece of parchment paper. Pat the dough into a rectangle about 1/4 inch thick. Dust the dough lightly with flour, and fold it in thirds by the short sides, like a business letter. Turn the dough one quarter of the way around in one direction, cover with another sheet of parchment paper, and roll out into a rectangle about 1/4 inch thick. Flour a round biscuit cutter, and cut out rounds of dough. Place the rounds on the prepared baking sheet. Gather and reroll the scraps, sprinkle lightly with flour if the dough is sticky, and cut more rounds of dough. Place the rounds on the baking sheet. Brush the tops of the biscuits with a bit of extra cream, and sprinkle with coarse sugar to taste. Place the baking sheet in the freezer for 10 minutes, or until firm. Place the baking sheet in the center of the preheated oven and bake for about 17 minutes, or until very lightly golden brown, rotating once during baking. Allow the biscuits to cool completely on the baking sheet. While they are cooling, rinse the strawberries clean, then dry, hull and slice them. Once the biscuits are cool, split each in half horizontally. 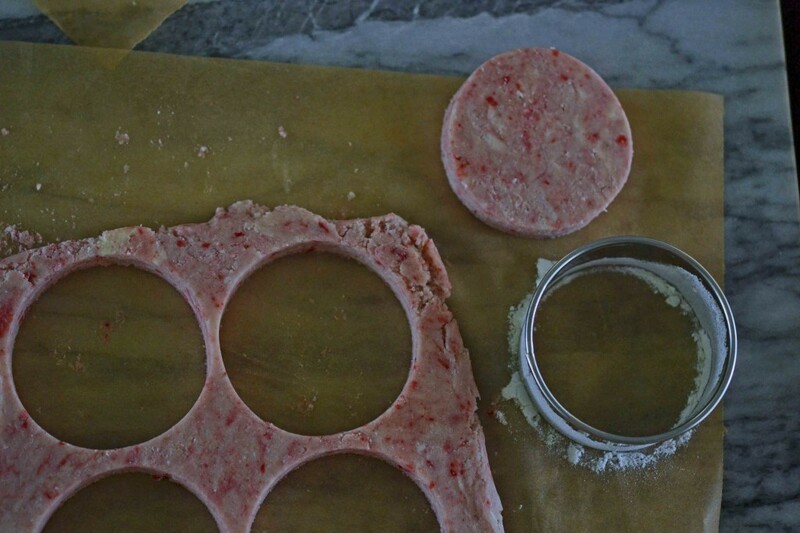 Divide the sliced strawberries among the biscuits, piling them on the bottom half. Cover the strawberries with a dollop of whipped cream, and replace the top of the biscuit. Serve chilled or at room temperature. And don’t forget the whipped cream! P.S. If you haven’t yet, please pick up a copy of My Cookbook! Thank you for making the blog possible through your support.